I am sure by this time "Kutti Krishnar" would have visited everyone's home and had lots of yummy goodies to eat. That is why he is late to visit my household, he!he!! Blogging about this auspicious day was quite a challenge to me.First, I had to draw the small foot impressions beautifully. Second, to prepare the all the sweet and savoury dishes to offer on the celebration day. Third, to keep the snacks safe from my hubby and friends who have a special talent to sniff out the goodies, no matter where it is hidden. Now all the three jobs are hard, atleast for me:) I can't really draw foot prints and more over all the rooms are carpeted. 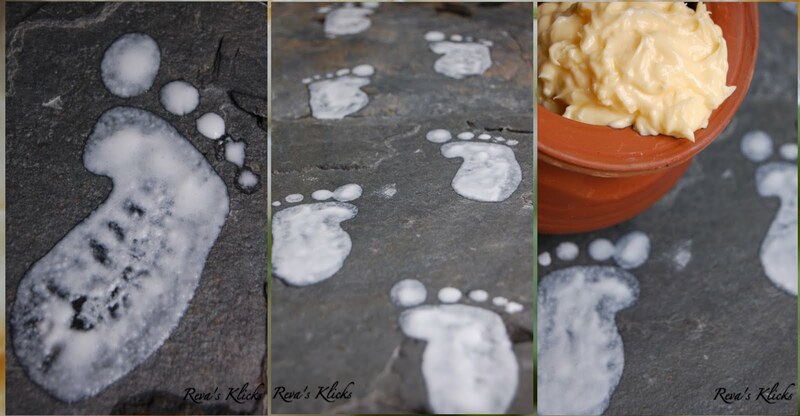 Me and my hubby went and got 2 slate tiles as I needed something as a rustic background for the footprints and for general food photography in future. 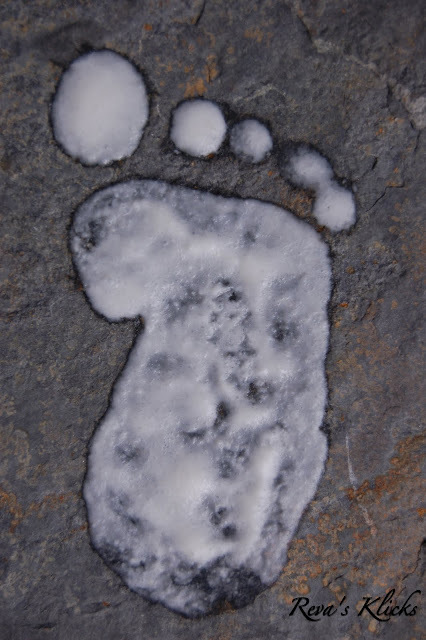 My dear friend Christy who is an talented Ophthalmologist, beautiful singer, wonderful friend and a very loving caring human [I can go on and on about her] helped me draw the footprints as I just took some pics. Actually we celebrated this festival last week as we had our friends Christy and Karthik over at our place. Me, my hubby, Christy and Karthik are all classmates from medical school and it is like we have not grown up from those lovely youthful days. Friends become family in a foreign place, isn't it? We all know that Lord Krishna is full of mischief and always playing pranks on everybody around. His famous act of mischief is to steal butter from neighbours home and gulp the whole thing down. "The butter is mixed with kalkandu [rock sugar candy]. Butter signifies our soul and sweet sugar represents traits like unconditional love, kindness, generosity, politeness and being humble. This indirectly indicates that our heart and soul should be filled with all the good qualities which makes everyone around us happy". This month's "Mangaiyar Malar" [which a women's magazine in Tamil] has a special festival edition. The real meaning of why Krishna steals butter is explained in a very simplified manner. 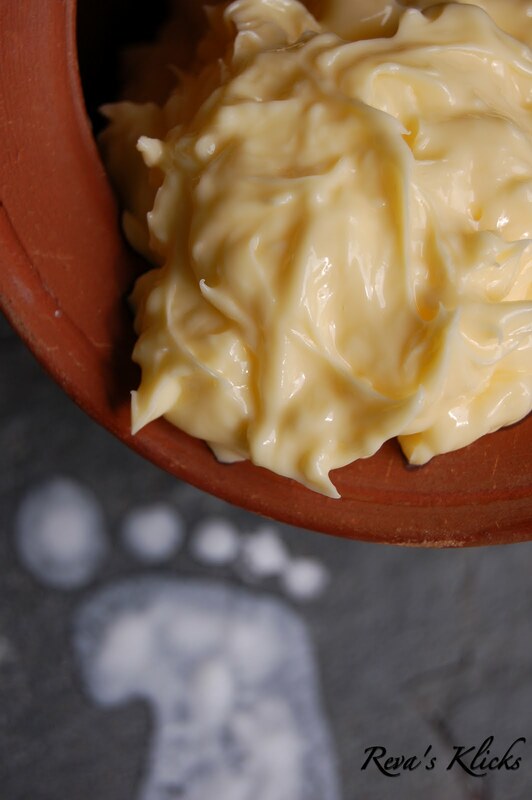 "Butter is churned out of curd which inturn comes from milk. Until then we actually don't see the butter. Churning action causes the butter to seperate from the whey and float seperately. It is this butter that Krishna eats. Like wise our soul and spirit is caught amidst all the worldly pleasures, responsibilities, hardships, our liking for material things, jealousy, anger, hate, laziness, cruelty etc. Chanting Krishna's name and praying to him enables our soul to leave all the worldy bonds and seperate like butter from whey water. The butter is eaten by Krishna meaning the soul of the person who has given up everything by chanting his name ultimately becomes one with Krishna himself being absorbed into his blood and soul". OMG! wonderful post with beautiful clicks.....no words to appreciate your patience and getting to know things in detail....appreciate your hard work! Awesome Clicks. Sincerely pray that Lord Krishna showers his blessing to you and your family. Enjoyed the well worded write-up. Clicks are amazing, Janmashtami wishes to u and ur family too. Nice write up and cute clicks there Reva. Happy Janmashtami to you and family ! Very beautiful post...loved reading it and looking at the clicks too.. Wonderful Klicks... hope u enjoyed well.. By the way, where is the sweet... ??? revs thats cute steps! !beautiful click! Touched by Wonderful explanation about krishna and butter. Happy Krishna Janmashtami to u and ur family. I am sure krishna bhagwan enjoyed this a lot. The krishnar padams so perfectly drawan n so perfectly clicked.. n perfect neivedhyam with rock candy.. Superb clicks and wonderful presentation,Happy krishna janmashtami to u Reva..
Lovely post and nice clicks. love the cute footprints.. nice clicks..
this is such a beautiful post Reva. 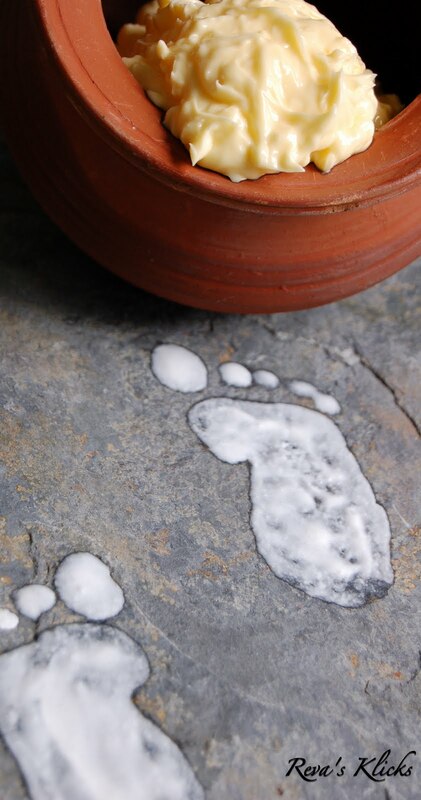 Love the footprints and the matka filled with butter. Great post.